U.S. carriers, including AT&T, Verizon Wireless, T-Mobile and Sprint, are refusing to support Samsung's efforts to pre-load its third party, LoJack-branded theft deterrent system on the devices they sell, according to note by New York Times blogger Brian Chen. San Francisco district attorney George Gascón and New York attorney general Eric Schneiderman have led a campaign to deter rampant thefts via a "kill switch" mechanism advocated under their "Secure Our Smartphones" program. The campaign was initiated in response to a crime wave that has targeted smartphones (and particularly iPhones) as being easy to steal, wipe and then resell, a practice that even carrier blacklists (when enforced) do little to slow because many stolen phones are being shipped overseas for use on foreign carriers. The two politicians did not outline their own solution, but instead demanded a technical fix from hardware vendors. Apple announced Activation Lock as a feature of iOS 7 this summer. Security experts in California working with Gascón examined the technology after it was released. Last week, Gascón tweeted an endorsement of Apple's solution to arresting phone theft, stating, "I'm using the IOs 7 with the find my iPhone feature which allows me to basically brick the phone if stolen or lost." 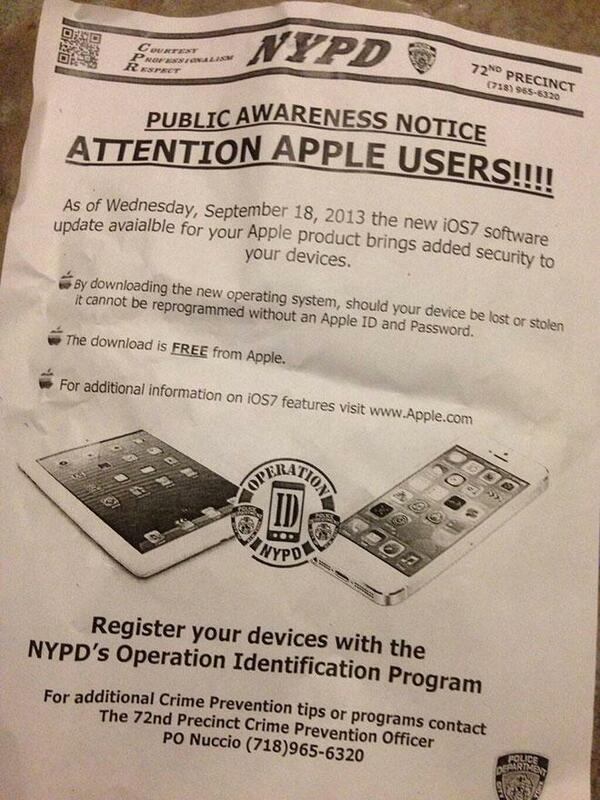 Police in New York have also advocated an upgrade to iOS 7 for the security feature. Gascón has equated Samsung's bundling deal with LoJack on certain models of its premium Android devices as an Android alternative to Activation Lock, although the service is limited to less than a third of Samsung's smartphone offerings. Chen cited Gascón as complaining that while Samsung's proposed anti theft software "has the potential to safeguard Samsung customers," emails between Samsung and phone carriers indicated that they were concerned that Samsung's kill switch software, which is offered as an annual $29.99 subscription fee, would compete with their own insurance offerings. Gascón alleged that "the carriers rejected it so they can continue to make money hand over fist on insurance premiums." Chen also referenced the CTIA trade group representing carriers, which argued to the Federal Communications Commission in June that "a kill switch isn't the answer" to controlling device theft, noting that any preloaded software with the ability to remotely disable a phone could by hijacked and used by hackers to interfere with service. Another problem the CTIA has with such kill switch apps is the concern that once a phone is remotely killed by a user, it could not be easily reactivated. Conversely, if it were easy to work around the lock, it wouldn't serve as an effective theft deterrent as thieves could work around it, too. Apple's new Activation Lock feature aims to kill the market for stolen iPhones by requiring users of any locked iPhone reported as stolen to authenticate with iCloud before reactivating the device via iTunes, even after a device "wipe" reset. The service is free, but requires setting up an iCloud account and locking the device with a passcode, a practice Apple has made more appealing with the convenience of Touch ID on iPhone 5s. In addition to Activation Lock, iCloud also optionally allows users to turn on Find My iPhone, when enables them to find, track and remotely lock or erase a stolen iOS device. 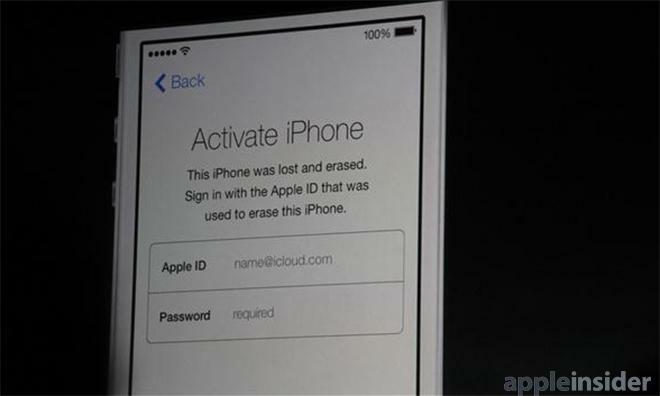 Activation Lock remains in place even after a phone is remotely wiped, making a stolen phone impossible to resell. Apple's iCloud, Activation Lock and Find my iPhone features are all handled by the company itself, and don't involve the carrier. The features even work on non-mobile devices like a WiFi-only iPad or iPod touch. In 2007, Apple disrupted the carrier status quo by negotiating a new user experience for iPhone, leveraging the device's incredible demand from users to elicit strong concessions from phone carriers that made Apple the central hub for all apps, media sales, cloud storage and software updates. Carriers who resisted Apple's control over the iPhone ecosystem, including Verizon Wireless in the U.S. and NTT DoCoMo in Japan, were forced to watch their best subscribers leave in droves until they capitulated. The iPhone's powerful leverage allowed Apple's iOS to skirt fragmentation issues erected by carriers who want to differentiate their offerings with their own app bundles and force users to buy content, insurance plans and security software through them, rather than the phone's hardware vendor. Android licensees like Samsung just sell their devices to carriers, and don't activate their phones for end users or exert much control over the ecosystem, which is shared among the maker, carrier, and the platform vendor. Samsung and other device vendors have little clout to demand from carriers the same kind of control Apple has over end users' experience because Android and Windows Phone vendors are selling commodity products with little differentiation. Google hasn't addressed the problem of rampant device theft in Android, and can't really because it doesn't have any real control over how licensees use Android either; Google is powerless to demand concessions from carriers, and has little leverage with hardware makers. Additionally, rather than seeking to exert leverage against carriers on behalf of end users to deliver a better hardware experience, Google has advocated the "openness" of Android as an competitive alternative to iOS, offering carriers the tantalizing opportunity to win back control and set up their own app stores, bundle layers of apps on their devices and interrupt the free distribution of software updates. Even Google's own Nexus and Motorola-branded phones do not offer a built in kill switch mechanism similar to Apple's iOS 7 Activation Lock.